I started by watercolouring a green stem, just to get the basic length and size for my flower. I diluted three colours of Stampin' Up! re-inkers by about half with water ...maybe a little more water than that. Then I bundled up five q-tips, securing them with an elastic in the center, made a second bundle of three q-tips ... again securing with elastic, and then had a single q-tip. I added colour to the flower, starting with the larger bundle and darkest purple ink (blackberry bliss). As I moved up the flower, I used the smaller bundle with the medium purple (elegant eggplant) and then the lightest purple (wisteria wonder) more near the top. I used the single q-tip to add a bit of variation through the whole flower. I then hand painted the two leaves and shaded using different colours of Gansai Tambi watercolour paints. To finish, I splattered both the green and dark purple over the card front and stamped the sentiment in the dark purple. I used a waterbrush to move the ink of the sentiment to give it a more watercoloured look. Here's the link to the video that I watched. How fun is this! I almost wanted to try it until you said you had to paint the leaves- as in free hand. Love how this turned out, Loll and love that delicious color you created! This is really clever and your spattering is the perfect final touch. Your lilac is absolutely stunning and so realistic. I am going to give this a try, after watching the video, but I am not too sure my stem and leaves will look as great as yours.I look forward to your blog and inspiration it gives me!! Thanks!! I love this!! I love lilacs and you've captured them perfectly - and got me yearning for spring and the blooming of my three bushes. Great to keep it so simple and let the lilac really take centre stage! Love, love, love this! Not only is your lilac beautiful, but your leaves are amazing! Love the shading! Loll, I subscribe to Jay Lee's you tube channel, she is an awesome watercolour painter and does some cool techniques. Amazing effect with your Q-tip lilac, it looks so cool. Love it. So very beautiful!...and thank you for re-introducing me to Jay Lee's tutorials! My two little grand"babies" (3 1/2 and 5 1/2) want to learn to watercolour. We have had so much fun painting pictures and trying different (simple) techniques. I can't wait to give them palates and bundles of Q-tips! :D I love your work and your creative inspiration! Thank you so much for all you share (and all I have learned from you!). This is a WOW, Loll. You are so good at water coloring that I guess a "free form" version is a natural step. This outcome is so beautiful and pleasing to the eye. Q-Tips! Wow, what a fantastic outcome this is. It looks so natural and you did a wonderful job of shaping this flower. The colors are lovely. Thanks for sharing this. What a fun technique. I enjoyed watching the video and the adorable baby. Oh how I love your daring experiments! I learn so much every time I come over here. Why am I new to this party? Anyway, what a fantastic lilac! Your three inks give just the right amount of depth and the way those Q-tips work together gives it just the right shape! Beautiful stem and leaves too, I might add! Sensational!! Love the vibrant color on this card. Your Q-tip technique sounds like fun! Gorgeous card and technique, Loll. It's new to me too. Beautiful intensity of colour. Wow, this is fantastic, Loll! I'm glad you shared the link, I wasn't quite getting how you did it at first. (early in the morning for me right now, LOL) What a neat video-will have to finish later. 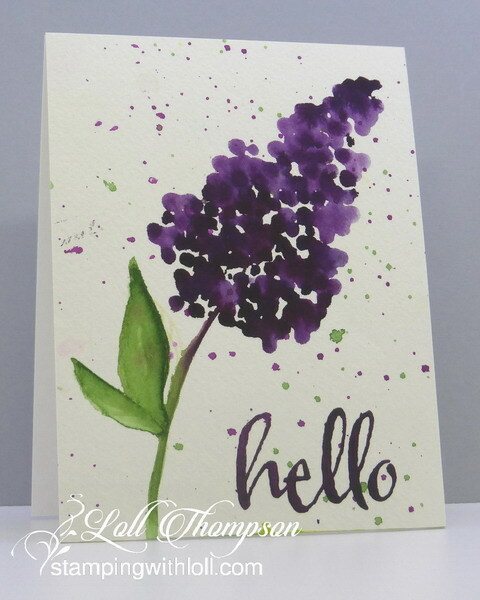 Your lilac is so pretty and I'm thankful that you do experiment and share! Happy weekend to you! I'd say that's one technique that worked well, Loll. That lilac is gorgeous.